If there’s one thing that developer LucasArts is known for, aside from bringing George Lucas’s far, far-away galaxies to game systems near you, it would have to be the gaming gold mine of witty and whimsical adventures that the company produced in the nineties. A winning formula of clever puzzles, memorable characters, and sabre-sharp writing has ensured these games a place in the most hallowed sanctuaries of interactive classics. 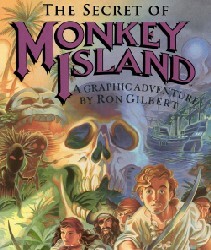 Among these was the Monkey Island series, which was comprised of four entries in its initial glory days from 1990 to 2001. Much to the exultation of adventure game lovers everywhere, whose genre of choice has become a dying breed in recent years, the Monkey Island series has been resurrected after nine years in limbo. Its glorious return is heralded by both an all-new 5-episode entry into the series, known as Tales of Monkey Island, and a high-definition remake of The Secret of Monkey Island, the game that started it all. Since you’re here to learn about the latter, let’s dive in. Meet Guybrush Threepwood. He wants to be a mighty pirate. Of course, no one ever accomplished their life’s greatest ambitions without meeting a rogue’s gallery of quirky weirdos and solving a variety of item-based puzzles–at least, no one I’m familiar with. Monkey Island’s story eschews heart-breaking drama and philosophical waxing for a simple and charming tale that’s animated by the eccentrics that you’ll meet at every turn, from a fast-talking, plaid-wearing used-boat salesman to a well-spoken trio of cannibals. The writing is the stuff of legends, and has truly withstood the test of time; the humour is just as relevant in 2009 as it was in 1990. It doesn’t hinge on contemporary celebrities and pop-culture jokes to elicit chuckles; it instead presents one ridiculous situation after another in a wholly compelling manner. Do you like puzzles that involve skilful and inventive manipulation of cooking pots and rubber chickens that have pulleys in the middle? If so, this is the game that has spoken to you from your dreams. Gameplay in SoMI: SE revolves entirely around overcoming obstacles that challenge your creativity and tenacity. You’ll eventually learn to throw common sense as you know it into the nearest incinerator and instead adapt your grey matter to a far more useful “What would Guybrush do?” mindset. Some puzzles are more intuitive than others, but they’re all well-designed; their solutions make perfect sense in their own twisted ways, and the tingling feeling of satisfaction you’ll get when you have your “Eureka!” moment is without peer. Fortunately for those who are in it for the humour and not the mental kinks (you are not to be blamed), there is a hint system–new to this remake–that you can call upon to prod you in the right direction whenever you feel as though you’re about ready to slip into despair. There’s also the fact that, like all LucasArts adventures, dying a terrible death or becoming permanently stuck by misusing an item are nigh-impossible. That’s not to say you can’t die if you really put your mind to it, though. . .
Graphics: High-definition? In MY Monkey Island!? Fear not, retro lovers; SoMI: SE remains faithful to its predecessor in every way. In fact, it was built right on top of The Secret of Monkey Island, and you can see proof of that in the comically stiff animations that imitate the sprites of 1990 perfectly. But there’s no need to take anyone’s word for it: at the mere click of a button, you can swap between the new visuals and the old at your leisure, even in mid-conversation. This is a truly cool feature that was also used in another recent Xbox Live Arcade remake, R-Type Dimensions. Of course, it would be remiss not to mention the obvious work that went into the new graphics, which are colourful, charming, and add new details to give the exotic locales an extra bit of personality. The simplistic beauty of the original art has a charm of its own, too, so the swap-on-the-fly system makes the experience fun for all tastes. Music N’ Sound: Ear-piercing reggae never sounded so good. The other aspect of SoMI:SE that has received a new-millennium update is the sound. The most obvious change here is the addition of voice acting, and it’s provided by a cast of voice actors that really know their stuff, from Rob Paulsen to Cam Clarke. Even if you don’t recognize the names, the voices are bound to ring a bell or two; these folks are no strangers to bringing beloved characters to life. The music also received its fair share of love and care; it was sometimes difficult to hear the original’s music without turning up your speakers a few extra notches, but this remake’s remixes stand out nicely and provide a wonderful accompaniment to the Caribbean hijinks. Those who prefer the original tunes, however, will be happy to know that switching the graphics to their original beauty does the music the same courtesy. The thing about puzzle-driven adventure games: you beat them once, and you know how to beat them again with minimal effort. However, SoMI:SE is not completely devoid of incentives for a revisiting. There are plenty of dialogue options, and you certainly won’t be seeing them all in a single playthrough, so a second run lets you discover even more of the game’s treasure trove of jokes. There are also two possible endings to see, and, of course, achievements to strive for if you’re playing the XBLA version. The real reason you’d want to pay another visit to Monkey Island, though, is similar to the reason you watch your favourite movie time and time again; you just can’t get enough of it. Q: Why might SoMI:SE not be my tankard of grog? A: If you’re in the market for heated, thumb-blistering action, approach with caution. Monkey Island’s gameplay is built entirely around the idea of solving bizarre, head-scratching puzzles. It certainly isn’t an impossibility that the game’s humour will manage to win you over, but be sure to try the demo before you buy. Sadly, the demo doesn’t give you the opportunity to solve any of the game’s puzzles, but at least you can get an idea as to whether or not you’ll be getting your money’s worth of laughter. Q: Why is SoMI:SE worth going ape over? A: This game is the ideal remake. It caters to newcomers to the series with a lush and colourful HD presentation, retaining all of the brilliant situations and dialogue that made the original such a timeless classic. It also caters to the purists who just want to relive their fond memories of this jewel from the nineties by allowing them to deluge themselves in nostalgic bliss at the click of a button. Monkey Island games will always have a special place in my heart. It was one of the first proper games I played as a kid. I remember constantly asking my uncle for help cos I couldn’t figure out what to do!